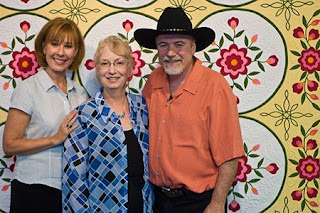 My episode of The Quilt Show with Alex Anderson and Ricky Tims aired online yesterday! Several of my friends from Miss Kitty's Quilters joined me to watch the show together. We pulled down the 'big screen' and hooked up my computer to my video projector and speakers, and had a great time! The show's editors did a super job of editing out my blips and most embarrassing moments, and only left in the good parts. They made me look really good. If you don't know about The Quilt Show, it is a website with a subscription series of quilting programs with special guests, and instructional segments, and plenty of beautiful quilts. The website also has lots of features that are free. 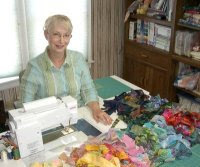 If you haven't already done so, check it all out at: http://www.thequiltshow.com You'll be really glad you did! My web designer and dear friend Ruth Hirsch just left for Colorado, and I miss her already. 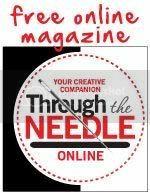 She suggested that I use this blog for little instructional videos and quick tips for quilters. What a great idea! So I'll try to share a few ideas with you in each new blog. 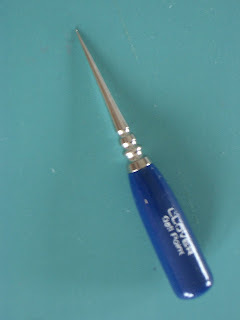 Today, I'd like to share with you one of my favorite tools: The Clover Ball Point Awl. I use this tool for guiding fabrics through the sewing machine, especially when it is important that I control the seams to keep them feeding straight all the way to the edge, like for the points of star quilts. Of course, this tool is made of metal, so you can't risk getting it too close to the sewing machine needle, but it is very useful in keeping the points together until stitched. One of my favorite uses for this unique tool, however, is for un-stitching (AKA ripping out seams). The ball point will slide under a single stitch, making it easy to pull the stitch out without cutting the thread. I use it to remove stitches without leaving all those nasty little 'hairs' to pick out of the seam line later. It is quicker and safer IMHO than using the traditional seam ripper. Check it out!